Off the beaten path on Broadway & Delaware, Jackson’s Corner resembles a clean, modern mercantile. Entering the building reaffirms the mercantile feeling with busy modern buzz. The east wall is filled with drinks, focusing on specialty beers & unique drinks. The back of the store has a coffee bar (I’m not a coffee drinker so I have not tried this). Order at the counter then choose a table or sit at the bar overlooking the cooking area & pizza oven. Free Wi-Fi. It is usually packed during the noon hour. We frequent Jackson’s Corner and have several favorites off the menu, depending on mood; steak sandwich, mahi mahi burger, Thai salad, coconut curry soup, chicken noodle soup. The pizzas are also great but I prefer the sandwiches. My husband likes the Kombucha (fermented tea drink), you can also refill your growlers here. Kombucha is an acquired taste, ask to try a small sample. I’m glad I tried it but I won’t order it for myself. The Thai salad has a sweet & mildly spicy dressing. Choose from a variety of meats, seafoods or vegetarian. I don’t usually go for vegetarian dishes but but I love the stir fried vegetables even better than the prawns, I think this is a first for me. 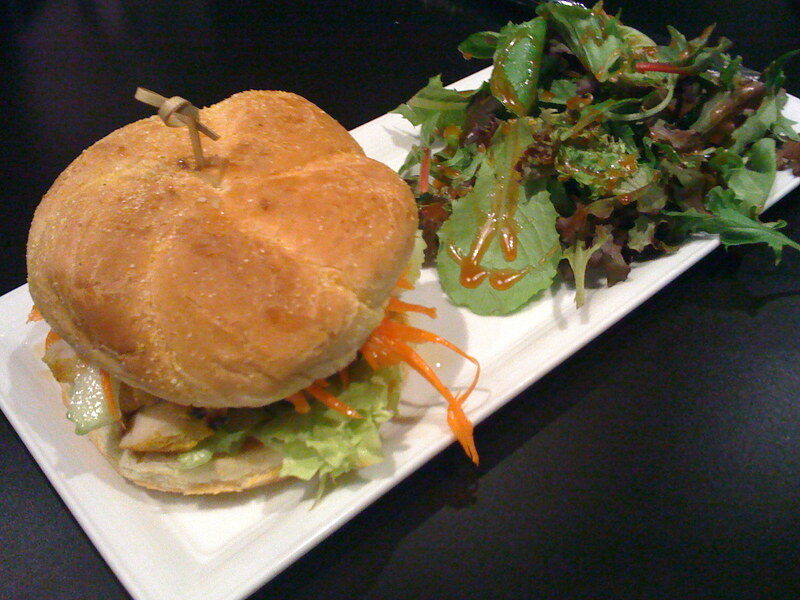 The Mahi Mahi Burger is a favorite that my husband & I split often. The mahi tuna melts in your mouth, served over Thai sweet & mildly spicy cole slaw on ciabatta bread (made fresh daily from a local bakery). Includes a side salad, I usually substitute the house dressing for the Thai dressing. You must try Jackson’s Corner for yourself. Bo Restobar is another amazing restaurant masquerading as a bar. The service has been great on every visit, the food is spectacular & the drinks are as good as the food. It can be packed but you can also have the whole place to yourself if you come @ a non peak time. Bo & Typhoon are separate companies but owned by the same person. The Typhoon flavor has a few similarities as Bo (this is a good thing for both of them). The most unique thing Bo & Typhoon offer is the Lemongrass Clam Chowder. If you want traditional chowder, this is not for you. If you want chowder infused with a Thai lemongrass zing, you must try it. I can not get within a mile of here without craving this chowder. On my way out of state, I had to make a pit stop for this Lemongrass Clam Chowder. The Happy Hour menu has most of the same foods @ low prices. The portions are smaller but this just allows you to try more items. The Lemongrass Clam Chowder is $3, Salmon stick is $2 or $3, everything is delicious & affordable. I have tried many items from Bo Restobar & have loved everything. The Lemongrass Clam Chowder is my favorite, my husband loves the noodle bowl. Depending on when you go, lunch, dinner or happy hour you can find prices from $2-$29, you can always find items around $10. 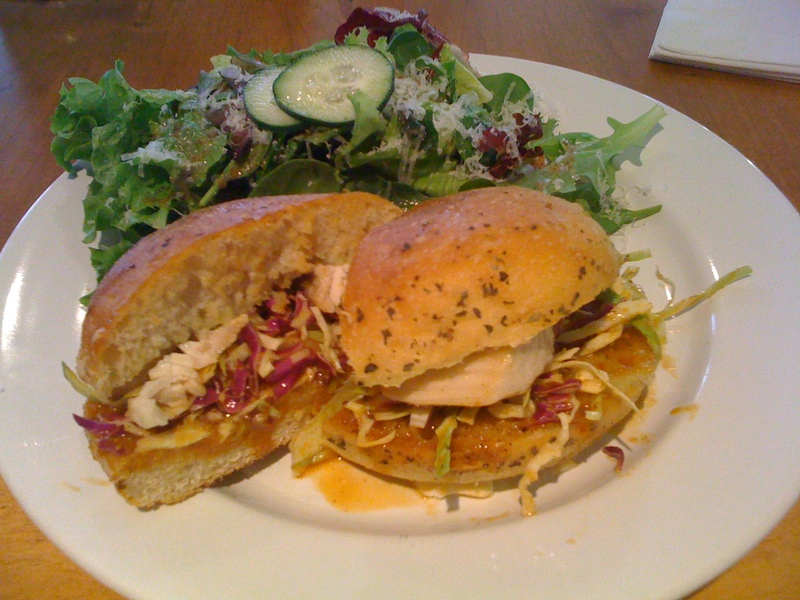 Our friend with celiac disease was able to have a turkey sandwich, without the bread. She said it was “yummy”. There were not options on the menu but they were happy to accommodate her. UPDATE: They now feature Karaoke. I don’t know the hours or specifics. I am nice enough to not torture others with my voice so I don’t sing Karaoke. I have seen a gentleman sing several Tony Bennett songs wonderfully, I also saw an amazing girl sing, on the table, she probably would have at least made it to Hollywood week on American Idol. Then there are of course the usual Karaoke singers with a big range of talent. I braved the Karaoke bar, alone on Halloween, in my cowgirl costume, just to get the Lemongrass Clam Chowder. You are currently browsing the archives for the Thai category.